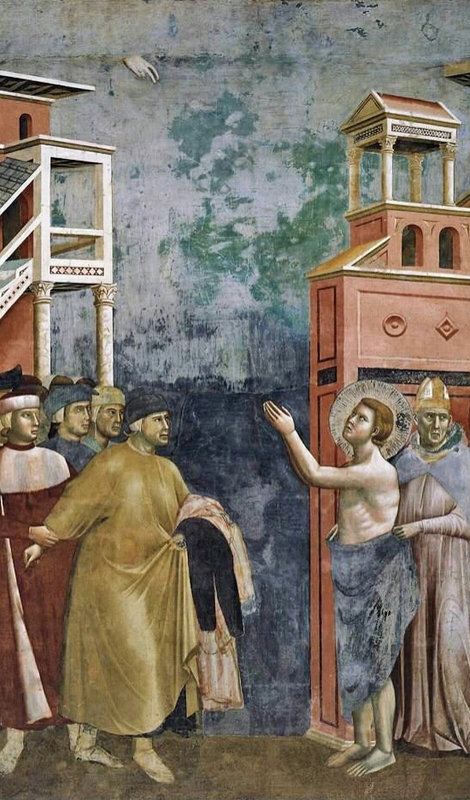 Giotto (14th c.) "Francis Gives Up His Possessions" (detail). Happy Feast of Saint Francis of Assisi! So much can be said about the whole life of this singular man, so radical in his witness to Christ and at the same time so deeply human that it is hard for anyone not to love him. I find it helpful to relate certain details about his conversion and vocation experience that are not so well known. Indeed, my column Great Conversion Stories in Magnificat magazine's May 2015 issue does just that. The outlines of St. Francis’s conversion from a rich young man and would-be knight to a great saint are well known. We recall his lavish and frivolous youth, his military misadventures, and his return to Assisi in 1205 after imprisonment, illness, and a mysterious experience that drew him to a greater service. Christian and non-Christian interpretations of St. Francis often depict him as a man who left worldly life and its distractions so as to commune in a kind of isolation with God (or “nature”). Historians sometimes portray Francis as a spiritual maverick who transcended all institutions including the Church and her human ministers. But the life of St. Francis was not like the wandering of medieval heretical sectarians or today’s uncommitted spiritualists. Rather, St. Francis was always entirely attached to the Catholic faith and obedience to the Church. In the year 1205, when Francis returned from Rome searching for God’s will, he found a person, a friend, who remained a crucial figure in the development of his vocation, a figure whose significance is seldom given its due weight: the bishop of Assisi. Bishop Guido is known to history as the man who covered the naked Francis with his episcopal cloak after the young man publicly renounced his inheritance and all his property by returning even his clothes to his outraged father. But Francis and the bishop already knew one another by that time. It was Bishop Guido who probably first advised Francis to seek solitude, not to wander but to pray, following the tradition of the desert fathers. After Francis heard Jesus in a vision from the cross of San Damiano, he probably met again with the bishop. By the time his father came with his lawsuit, Francis appealed to the Church’s protection and the bishop’s judgment. Guido knew well already the young man who shocked so many others by embracing total poverty, and who would later draw them to follow his sanctity.